With the installation ‘Fragile’, Hilde Kentane participates in the group exhibition ‘Le Mal de Vivre 2014’. 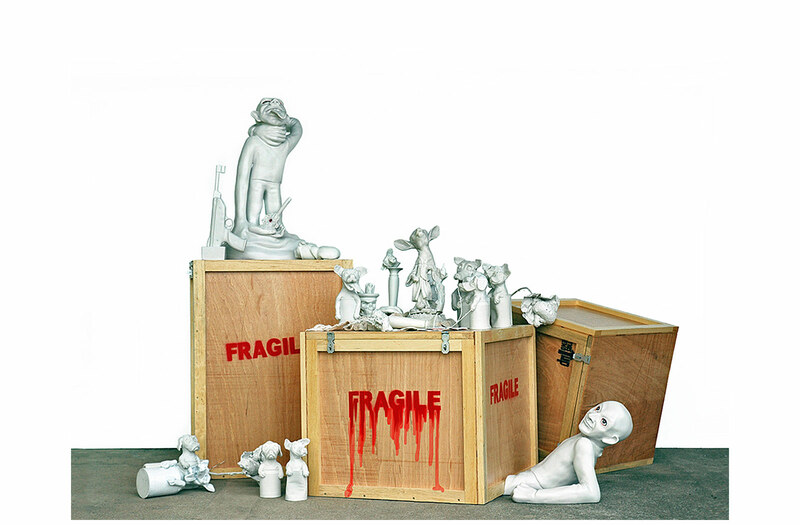 `Fragile is an installation that includes sculptures and their wooden moving crates. This installation was produced in Brazil (Sao Paulo), where I have been living and working since 2011, and it was moved to Basel for the group exhibition ‘Le Mal De Vivre’. The work is about challenges, leaving behind memories and unidentified emotions. The beauty and distress that comes with constantly moving to other countries. A collection of unfinished fragments and unnecessary things from the past mingled with new impressions and experiences. Creating new stories, a repetitive process that leads to ´going away feels again like arriving´. Strong personal impressions of Brazilian society like African-rooted rituals, religions and omnipresent street-dogs (see project 250 dogs) are reflected. The sculptures are made of resin and marble, calcite and ceramics. The crates were actually used to transport the sculptures and are an integral part of the story telling`.